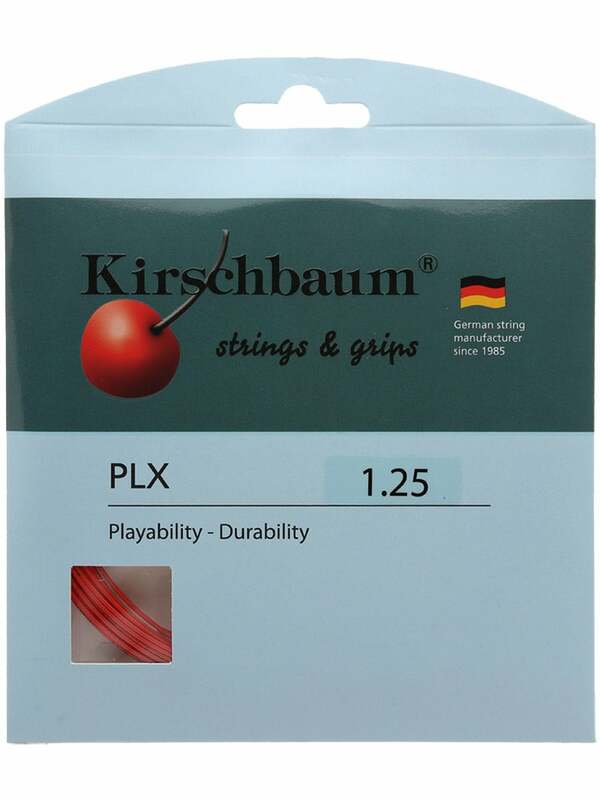 The Kirschbaum Pro Line X is the latest polyester tennis string in the extensive line of Kirschbaum line. It was in a “care package” that Kirschbaum sent me. I had already heard of this string and some of it’s characteristics, so needless to say, I was very much looking forward to reviewing the cherry-orange Pro Line X.
I am one of those people who enjoy stringing tennis racquets, my own and for my clients; having to string this string made the process a bit more painless. Kirschbaum Pro Line X was very easy to string. So easy that I finished faster than I had all day. The weaves on the crosses were easy peasy, I did not have any problems whatsoever. No kinks, twists, nada; it was actually quite nice. The knots were tight and the tension right off the stringing machine was spot on. From the first ball, I knew this was going to be a really fun string to play with. The characteristic that stood out to me the most was the feeling of the strings at ball contact. It was incredible. The pocketing of the string was really exceptional; as the ball would come off the stringbed, I could feel the mains snapping back and ‘catapulting’ the tennis balls forward with some nice spin, all the while giving me crisp power. Even though the string is categorized as “low powered,” the orange colored string did provide me with some nice pop. Faster swing speeds provided with excellent, penetrating pace; even with slower swing speeds, the Kirschbaum produced just enough to give me a nice ball. The Kirschbaum Pro Line X gave me some exceptional serves. The strings provided me the right amount of pop and spin on all of my serves. I like to hit heavy flat serves, with this string setup, I got just that, heavy first serves with some zipping pace. Even on kick and slice serves, the strings outperformed similar tennis strings. The serve that stood out to me was my medium (75% power) kick serve, the strings hugged the ball as I would swing upward and snap at the top of my service motion, the ball would land where I wanted it and it would violently kick up and out, making it easy to mishit or for me to rush the net and put away a volley. Really just a pleasure to hit that with ease. I’m not the biggest fan of volleying, though recently I have been playing some doubles and I found the strings gave me some exceptional touch at the net. The Kirschbaum Pro Line X absorbed some hard struck passing shots, allowing me to place it cross court or even drop it on my opponents side of the tennis court. I was actually having fun at the net. Even though this is a polyester tennis string, which could have caused some arm troubles for me, I felt very little shock or vibration from the strings. I do play with a dampener installed, though I felt like the dampener wasn’t really necessary. The strings were soft enough during impact that it didn’t play like a traditional polyester tennis string. I really felt comfortable knowing that the strings would not irritate my arm or cause the return of tennis elbow. The only thing I didn’t like about this string was when it went dead. I got about 3 really solid feeling hours from this setup. The entire three hours was nice, good spin, pop, and feel; it’s just when the strings went dead, so did my game. Some polys allow you to get through the motions when they go dead, the Kirschbaum Pro Line X was the opposite, it was really dead. It lost all feel and control, I could hardly get the ball to stay in the court; I could have been mistaken for a beginner tennis player with all the shots I hit long, wide, and into the net. I was hoping the sweet characteristics of this string would last, unfortunately not so. I absolutely love this tennis string. It has a lot of the characteristics that I look for in a polyester tennis string, price ($8 at Tennis-Warehouse), spin, pop, comfort, and feel. Though the durability is the only downside of this poly; I like to get at least 5 hours of decent play from a set of strings, but at $8 it’s not that big of a deal I suppose. This string is a really nice offering from Kirschbaum, I think they have done a really good job with this. I have and will continue to recommend this string to my friends, I also recommend you try it out as well as a full bed or a hybrid, you won’t be sorry.